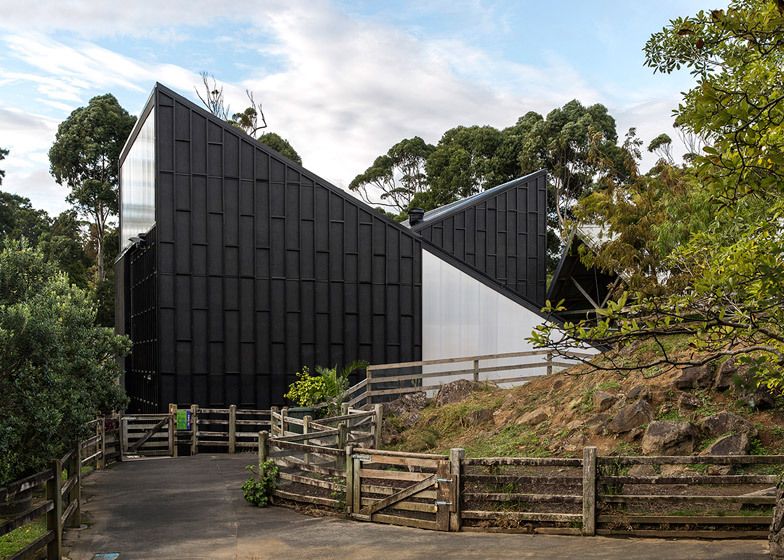 The two intersecting roofs of the Giraffe House at Auckland Zoo in New Zealand were designed to comfortably accommodate both its long-necked inhabitants and their human keepers (+ slideshow). New Zealand studios Monk Mackenzie and Glamuzina Patterson were asked to create a new giraffe breeding shelter to house the zoo's expanding herd. The brief called for an understated and low-cost shelter incorporating two dens with a separate area for the zookeepers. "When designing for the tallest living terrestrial animal there is a wonderful opportunity to play up the verticality of space," said the architects. "We explored through the section the internal volumes to accommodate a number of functional and operational overlaps, and the disparity in scale of its occupants." The building's slanted roofs clearly delineate the two internal dens and are intended to "accentuate the collision of human and giraffe scales". A bright yellow door set in one of the lower sections of the black-stained timber facade provides an entrance for the zoo staff. The height of the ceiling rises from three metres to 10 metres, with the tallest surfaces incorporating six metre doors for the animals. Clerestory windows above the doors allow natural light into the dens, while a similarly translucent section of wall next to the staff's entrance brightens the interior of the humans' domain. A mezzanine overlooking both sides of the interior provides a viewing area where the keepers and small visitor groups can observe the giraffes at an appropriate height. The interior was designed to be flexible, with moveable doors and walls allowing the spaces to be reconfigured to suit the changing needs of the animals. The four huge sliding doors connect the dens with separate yards and incorporate hinged sections that can be swung open so the giraffes can pop their heads outside without leaving the shelter. Simple construction techniques and a reduced palette of locally-sourced materials were employed to keep the project within budget. Other zoo architecture on Dezeen includes an elephant house at Copenhagen Zoo by Foster + Partners and a sustainable giraffe enclosure at Rotterdam Zoo by Dutch architects LAM. Photography is by Jonny Davis, except where stated otherwise.